Holy Trinity Church, which Ōtāhuhu residents informally called Selwyn Church, served the town’s Anglicans until the 1920s. But by 1925 the old building’s timbers were starting to decay. 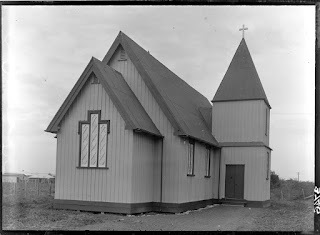 The vicar of Ōtāhuhu, Reverend Clarence Bourchier Wilmot Seton, also decided that the wooden church was too small for his growing Anglican congregation. By 1927 planning and fundraising for a new large brick church were well-advanced, and soon building work began on the new Holy Trinity Church which still stands in Ōtāhuhu today. 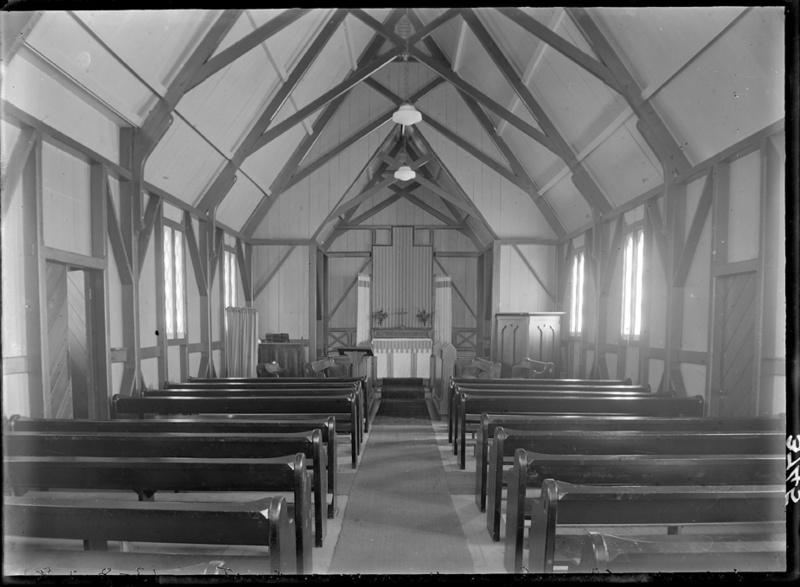 Ref: James D Richardson, Holy Trinity Church, Ōtāhuhu, 30 November 1928, Sir George Grey Special Collections, Auckland Libraries, 4-8791. This left Ōtāhuhu Anglicans with the dilemma of dealing with their old church. There weren’t enough funds left after building the new church to move the old one to the back of their Mason Avenue section where it could be used as a hall. Therefore it seemed that the old church would have to be demolished. Understandably, this caused an outcry among old parishioners, some of whom remembered its 1863 dedication. 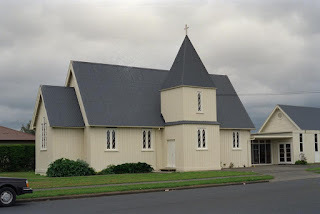 However a solution appeared when Māngere East Anglicans decided they needed a local church. They requested, and were happily given, Ōtāhuhu’s old Holy Trinity. So in November 1927 the church, roof, tower and vestry were dismantled into separate sections. The sections were loaded onto trailers and towed to Māngere East by traction engine. Getting there was an ordeal because the body of the church was jolted and twisted during its journey. 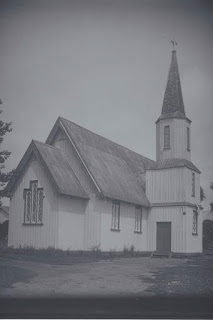 Furthermore when the trailer carrying the tower crossed the railway line at Māngere Crossing another mysterious accident happened, because before the church could be reassembled at Māngere East the tower had to be rebuilt. Unfortunately only a few photographs of the move and some sketchy newspaper reports about the church’s reassembly can be located today. However the entire exercise was a tribute to the craftsmanship and ingenuity of the builders involved. Sitting in the church and looking up into its exposed rafters one can but imagine the amount of skilful work it must have taken to re-bolt the building and roof trusses back together. And then the church still had to be re-roofed with sheets of roofing iron. Likewise, we don’t know whether a crane was used to help raise the church tower. Perhaps the builders rebuilt the shortened tower by working on top of the entrance porch, and then built the roof trusses from inside the tower. Its cross was certainly new: Holy Trinity’s cross was rotten so a new one was carved by the carpenter Ted Harvey. Ref: James D Richardson, Selwyn Church Māngere East, 18 August 1928, Sir George Grey Special Collections, Auckland Libraries, 4-3745. Ref: James D Richardson, Selwyn Church Māngere East, 18 August 1928, Sir George Grey Special Collections, Auckland Libraries, 4-3746. 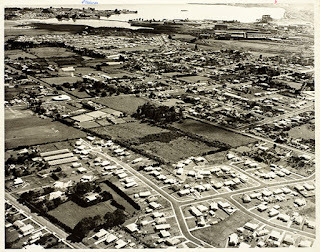 Ref: Trevor Penman, Aerial view of Māngere East, c1964, photograph reproduced courtesy of Māngere Historical Society, South Auckland Research Centre, Auckland Libraries, Footprints 05731. 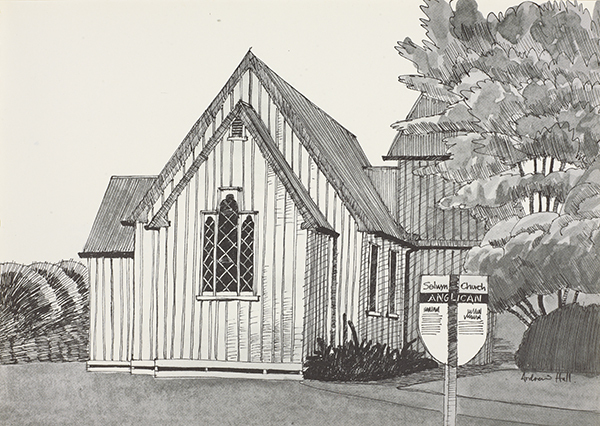 As Māngere East grew in the 1950s, Selwyn Church seemed to be getting too small for its congregation. Selwyn’s parishioners hoped that the Wells fundraising campaign might raise enough money for a new church. However the campaign was unsuccessful, so they reconciled themselves to making do with their old church. In early 1962 a parish working bee renovated, repainted and revarnished the church’s interior walls, fittings and pews. 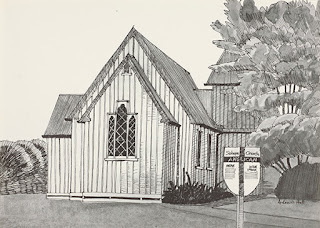 During the later 1960s Selwyn’s parishioners concentrated on making Māngere East a successful, independent parish and any lingering ideas about the need for a new church seemed to be forgotten. 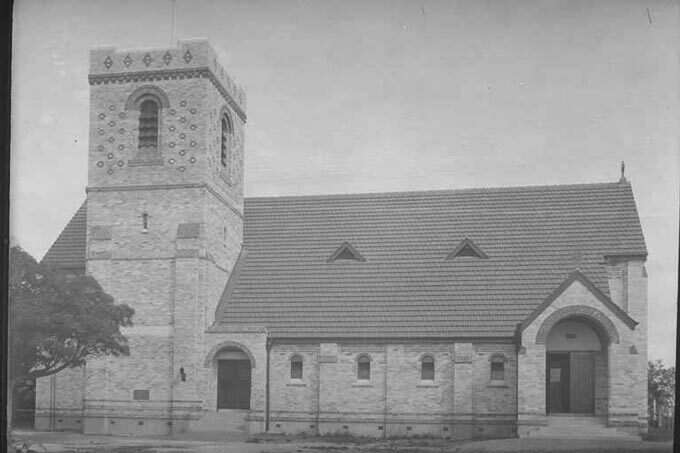 Later, in 1969, Selwyn Church and its separate Sunday School Hall were joined together when a new middle hall and linking foyer were built. Ref: Selwyn Church, Massey Road, Māngere East, June 1986, Sir George Grey Special Collections, Auckland Libraries, 1052-N4-12. The need for regular maintenance soon became a routine fact of life for an ageing church. In 1982 a severe storm caused significant damage to Selwyn Church’s north-eastern wall. John Stacpoole from the Historic Places Trust advised Selwyn’s vestry how to strengthen the historic church’s north-eastern walls and foundations. Fortunately these repairs stabilised Selwyn and the church has not since had any more sudden emergencies. Ref: Selwyn Church, Māngere East, c1979, South Auckland Research Centre, Auckland Libraries, Footprints 00979. 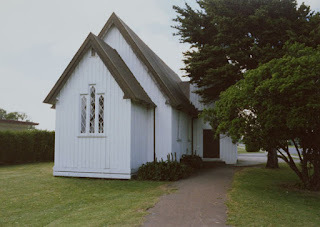 However when Selwyn Church’s vestry applied for council funds to landscape the church grounds in 2003, they had to get a conservation plan done for the land and buildings in the entire church precinct. 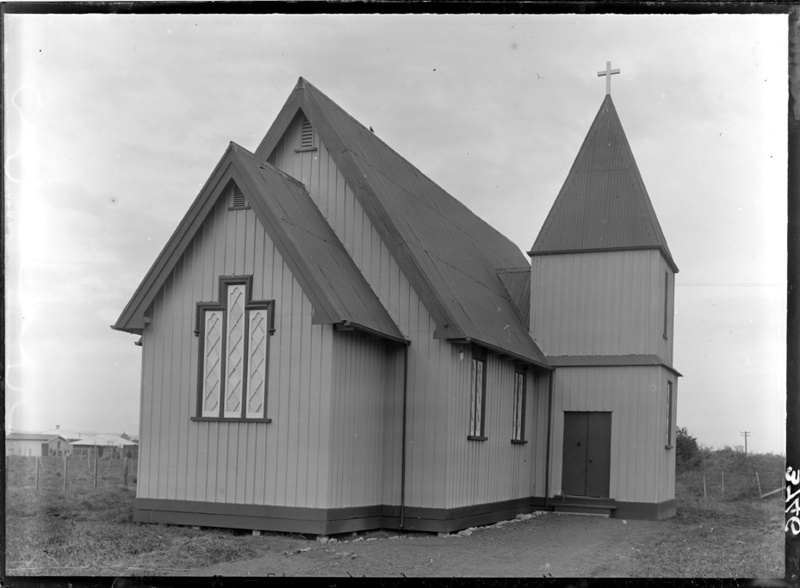 The conservation planners’ survey revealed that the old church had underlying structural problems stemming from its rocky journey to Māngere East in 1927. These would have to be repaired to prolong the building’s life. After a lengthy fundraising process, Selwyn’s vestry raised enough money to reinforce the old wooden building. In early 2011 buttresses were erected to strengthen the corners of the church and its south-western wall facing Hain Avenue. 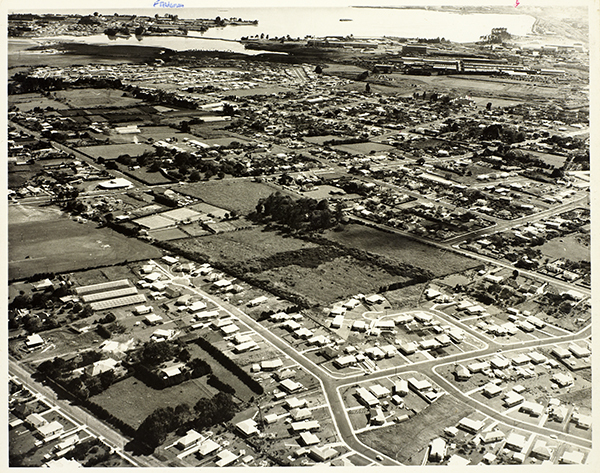 Ref: Andrew Hall, Selwyn Church, Māngere East, 1980, South Auckland Research Centre, Auckland Libraries, Footprints 07268.